Wow Denise, your story is pretty much my story. Gallbladder removed at 21, now 54 and through menopause. I have managed to put on an extra 100+ pounds, extremely discouraging….I watched the Hormone Balancing webinar and am going to check the Thyroid webinar, it’s obviously time to stop eating dessert every day and get moving!! I as well had my gall bladder removed, probably 20 years ago, thank goodness, that was so painful to go thru the many “attacks” I had for a few years before I found out the cause, I did have some weight gain, I am now 64, and the best thing I did for myself was the “whole 30”, it made me more in tune with my body, was able to lose that last 10 lbs, that was hanging in there, now I still continue with a paleo diet, but am always open to learning MORE! I think the key is to eat clean and stay active! Such a good story to share. Thank you for giving us your thoughts. After doing some research I think having my gall bladder removed has contributed to my hormone positive breast cancer which spread to six lymph nodes. After chemo and radiation I am taking tamoxifen and about to start aromatose inhibitors. What can be done now to help eliminate excess oestrogen from my body without the help of a gall bladder? HI Tierri, lots can be still done without the gallbladder! You will want to check out http://www.cookingforbalance.com to learn more about the body’s ecosystem. Thank you for your question. There are alot of things that can still be done with the gallbladder. It is important to keep the liver working in tip top shape. The Cooking for Balance free workshop will teach you about the Hormone Balance ecosystem. You can register here at hormonesbalance.com I hope you will join us. Thank you for your question. There are alot of things that can still be done with the gallbladder. It is important to keep the liver working in tip top shape. The Cooking for Balance free workshop will teach you about the Hormone Balance ecosystem. You can register here at http://www.cookingforbalance.com I hope you will join us. I am 53 and in perimenopause. My gall bladder was removed when I was in my 20s. I have been experiencing flatulence and general indigestion pain and ‘pop’ movements in my chest area in recent weeks. Do you please have any advice for me. The only medication I am on is Ramipril 5mg. Thanks so much. Hi Angela, thank you for your question. Check out the last part of the article about what kind of foods to eat. That is a good place to start. Additionally, you may want to try digestive enzymes with each meal and consider a probiotic. Hope that helps! I had my gallbladder removed 4 weeks postpartum. It’s been 4 years now and I have been battling anxiety and some panic attacks since the surgery. I was diagnosed with postpartum anxiety and went on 50mg setraline for a year after my baby was born. I went off the setraline for 3 years but have struggled badly and needed to go back on setraline for anxiety recently. I felt like I was swimming while walking, so dizzy I was afraid of falling down while walking. The anxiety heightens during week 3 of my menstral cycle. I constantly worry about everything and it’s worse in the mornings. I really think I have a hormonal imbalance. What blood tests should I start with? I don’t want to be on anxiety meds if something else is wrong? Hi Tiffany, I had a similar situation post partum (minus the gall bladder removal) and have been on oral progesterone bio identical for the last 10 years. You have your progesterone tested 3 days post ovulation and see what the number is. Low progesterone will cause anxiety and it is very challenging to feel anxious all the time. Once I got on progesterone my anxiety went away ;). Let me know if I can help you further. Hi Julie! Thank you for the advice!!! I keep saying that once my body knows it’s mot pregnant right after ovulation, I feel the anxiety kick in like clockwork. I just thought I was being silly! This really could be a problem?! I will talk to my doctor. Did your GP doc help you or your gynecologist? Tiffany, I go to a functional medicine place with a nurse practitioner that is dialed in on hormones. Unfortunately, most Gyns are not great with hormones. Try to find a functional medicine doc that is good with hormones where you live. Julie, would you mind sharing the name and office that you found a doctor who specializes in hormones? I need to see a specialist. thank you! Removed at 36 – 8 months ago always been slim and very active, I’ve experienced anxiety and the weight is coming on, I’m still very active and eat very clean. 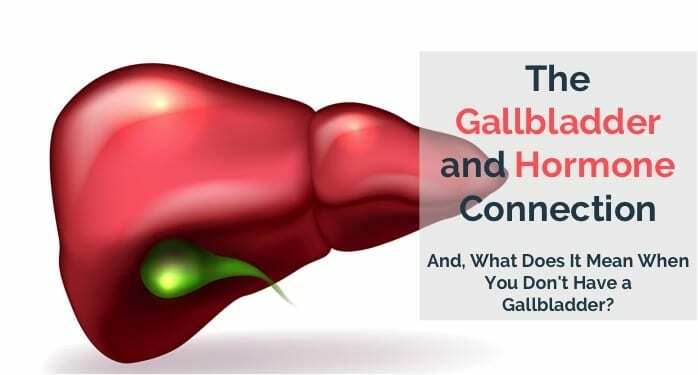 The liver and gall bladder work closely together. These detoxification pathways can become clogged by many factors including environmental toxins and body care products. It goes deeper than food and vitamins can cover. Thank you for being here and learning. Hi I recently had my appendix move along with one ovary during an emergency appendectomy. The surgeon was concerned that my ovary was the cause of my pain. It looked inflamed like a cyst had ruptured. I was glad he removed it because I think I was having issues with cysts for years. Now I am having gallbladder issues ironically after my ovary has been removed which I never had before. I don’t got the profile for someone with gallbladder disease. Doctors keep telling me stay away from fatty foods when I’ve been eating clean and organic for the past 5 years. I looked further that other foods cause gallbladder attacks which I’m avoiding now such as gluten, dairy, eggs and red meat. I’m going to do the gallbladder diet. Is there anything else I should do like get my hormones checked to see if that helps alleviate my gallbladder symptoms? I’ve already been to the ER once for severe symptoms. Heather, I would recommend having your hormones checked as soon as possible. Ovarian cysts are consistent with estrogen dominance in most women. High estrogen levels can cause gall bladder symptoms as well. Considering your history with ovarian cysts I think hormones could be at play here. I agree with you totally, I too feel like I was deceived. I wish I wouldn’t have had the surgery. It just causes more problems. I wish there was something I could do to stop it. Sorry about your friend. Without a Gallbladder but found something that HELPED! Gallbladder removed 10 month ago. Never had digestive issues. Once removed, I began to feel bloated, constipated, etc. Asked Doc to prescribe something that would help digest food. They were no help. I eat “CLEAN” always have and always will. Did my own research, and just stumbled on this product. What attracted me to this product was soy free, etc. free. Which you want in any supplement. Started taken this product for 4 days now and I feel amazing. No gas, no bloat and oddly – NOT CRAVING FOR FOOD? Is this possible. I read that this product would help with Pancreatic issues resulting from a missing gallbladder. But never imagined that it would curb my CRAVINGS. Anyone else experience this? I had put on weight since surgery, but now feel like my weight will come down since my food is ACTUALLY NOW DIGESTING! Anyone experience this side effect, please email me. Would love to hear your experience. Thank you. Oh and I workout like faithfully. Aging gracefully! From The Vitamin Shoppe- their brand_ multi-enzyme. I take 4 with each meal and 1 with coffee. (milk no sugar). 1 cup a day of coffee. I found i gained weight after surgery for sure. but I think perhaps why so many people may have issues, is perhaps their diet wasn’t clean to begin with. Just my observation. I eat clean and exercise. I am 54 yr old and for sure maintain a healthy lifestyle with these supplements. Anyone tried taking the multi enzyme? without any filers of course. I believe that is not true. There are water soluble vitamins and fat soluble vitamins (such as Vitamin D and a few others). If you do not have a gallbladder you should be able to absorb the water soluble ones just fine. BUT, since you do not have a gallbladder, you probably will have trouble absorbing fat soluble vitamins and end up with a vitamin D deficiency or any other fat soluble vitamin deficiency as well. You will have trouble absorbing fat soluble vitamins because your fat digesting ability has been hindered. The solution is to take digestive enzymes with food and the multi vitamin. That is my advice. I had my gallbladder removed and I have a vitamin D deficiency because of it. Dont ever ever get your gall bladder removed. My Mom did. Her life ruined with diarhea attacks. Me too. Diarhea uncontrolable diarhea… Miserable life. And Drs should be sued for misinformation. I live in Mexico. My maids told me you disdolve the stones with Jaimica. a drink made from Hibiscus…I want to get a gall bladder transplant! Ask your Pharmacy about it. They know much more about meds than Drs do! I had my gallbladder removed 10 years ago, I am now 54. Menopause begin within weeks after removal along with digestive problems. Even though I have made a lot of positive changes into my lifestyle since, nothing has changed the severe hot flashes that I have been experiencing shortly after removal. The ability to cope with the smallest amount of stress has been forever changed since surgery. I wish I would have been more informed about the connection of hormones after gallbladder surgery as I would have not done it.